View the training via WEBCAST (taped September 14, 2017) on your device at a place and time convenient to you. You will be emailed access instructions within 1 business day. 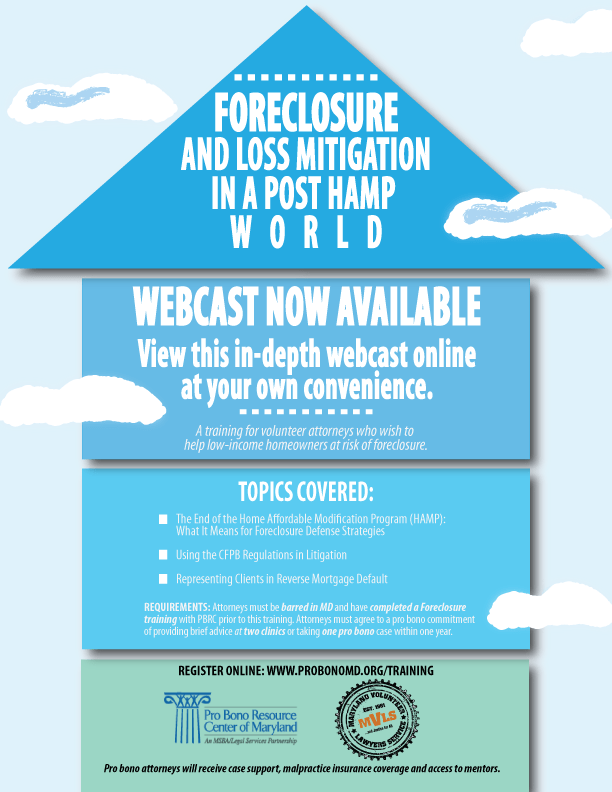 This training, offered as part of PBRC’s Home Preservation Project, is recommended for attorneys who are eligible to practice in Maryland, have completed the basic foreclosure training, and who are interested in learning about foreclosure defense strategies after HAMP, how to use the CFPB regulations in litigation, or about representing clients in reverse mortgage default. Participating attorneys must agree to fulfill two (2) units of volunteering within one year of registering. One “unit of volunteering” is EITHER providing brief legal advice at one (1) foreclosure solutions workshop) OR taking one (1) case placement from the Project.